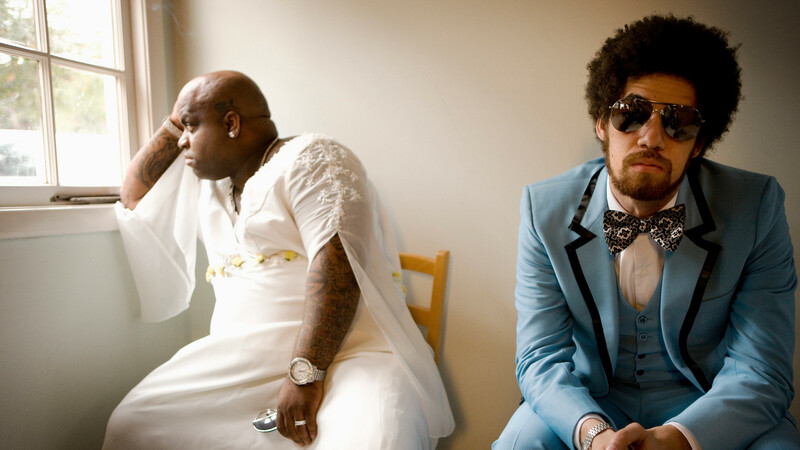 ODD COUPLE: Cee-Lo Green and Danger Mouse of Gnarls Barkley. Here’s an interview from the Milligan vaults: Danger Mouse. I interviewed the genius Brian Burton following the release of Gnarls Barkley’s The Odd Couple. 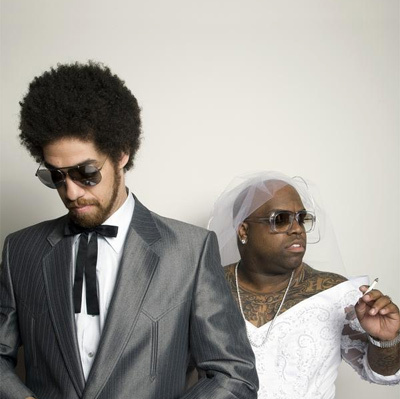 The partnership between renegade producer Danger Mouse and Goodie Mob vocalist Cee-Lo Green has turned into a breathtakingly unique musical act. Although they met in 1998, it wasn’t until 2003 when the duo would seriously start working together. Having exploded on the international radar with the monster-single ‘Crazy’ and their debut album, St. Elsewhere, Gnarls Barkley have proved that they’re not just a flash in the pan, with their follow-up release, The Odd Couple. Building upon their ‘spooky-soul’ sound, this second album brings them one step closer to being branded modern music’s most significant group. Nick Milligan spoke to Brian Burton aka Danger Mouse. You write the songs and Cee-Lo writes the lyrics – has anything that Cee-Lo’s written, like the suicide song ‘Just A Thought’, ever taken you by surprise? Not really, to be honest. ‘Just A Thought’ came from the second time we ever got together in the recording studio. We had the music written, but we didn’t want to record anything. We just talked for four to five hours, then we both had to leave. We didn’t wind up recording that day, but a lot of what we talked about ended up in that song. We got to know each other, so we were very honest from the very beginning. That’s how a lot of these songs come together. We talk about ourselves and life, rather than the details of the music, fast, slow, happy, sad, etc. We try to figure each other out. So by using this process, does Cee-Lo include your thoughts and feelings in the songs? Yeah, absolutely. I think that the records are very much him singing to the world, but also to me – and for me. I feel like some of the stuff he’s written, I couldn’t have written more personally, or better lyrically. But it comes from him so truly as well. It makes you feel very comfortable to have someone else sing about what’s going on in your own head. Do you see Gnarls Barkley as being a long-term project? Yeah, I think we both do. We use it as our home base. We think we can really do something with it as a group. We’re very inspired by it and by people’s response to it as well. We’re going to go in to record our third record fairly soon, I think. Gnarls Barkley write a lot of music on the road – are there many songs that are written that haven’t made it onto these two albums? No, maybe a couple of songs here and there that don’t get finished. But we’re not one of those bands that can do that. [Cee-Lo] digs so deep for something that when he puts it out there, it stays out there. Both of your albums have a spooky, dark-quality – where does that come from? I like the darkness in music – it’s always interested me a little bit more. All of my influences inspire it, whether its old soundtrack music, psych-rock or folk music – I get it from all over the place. I’m really affected by music. I can’t help it. I get moved very easily by anything musically that does that to me. Do you feel that The Odd Couple is as dark as St. Elsewhere? Yeah, absolutely. I haven’t really compared their ‘darkness’ or anything, but I could see how one might think so. Do you and Cee-Lo consider yourselves to be an Odd Couple? In some ways, sure. In some ways we’re similar and in other ways, not at all. We didn’t put too much thought into the album’s name. You’re known for your studio-based projects, like your work with Gorillaz and The Grey Album (where Burton spliced The Beatles’ White Album with Jay- Z’s Black Album) – was Gnarls Barkley originally intended to be just a studio project? I didn’t really envisage it as a live thing, no. But I didn’t not envisage it as a live thing. I didn’t think about it one way or another, because I never really knew how it was all going to come together. Was it difficult to initially interpret the music on stage? At first it was, but it got more comfortable as we went along. But we had a lot of players on stage – that’s how we compensated for it. The second album is going to be easier to play than the first one. We’ve already cut down the size of the live band, and now we have two albums of material to choose from. Having worked on so many projects, are you fussy over who you choose to work with? It usually just starts with me being a fan of the person. That’s the main thing. Then you see if you can work with the person or not. Some people are not necessarily easy to work with, but I haven’t run into that problem too much. A common love of music is all it takes. Do Gnarls Barkley have plans to return to Australia? I hope so, I love Australia. It’s one of the better places we’ve toured. The Odd Couple is available through Warner.